Marine renewable energy: could environmental concerns kill off an environmentally friendly industry? Abstract: The oscillating water column wave energy converter (OWCWEC) is an established device which produces electricity by causing an ocean wave to drive air through a turbine. A system to control the operation can improve the device’s performance. In varying sea conditions, different objectives for control may be appropriate. For example, in some seas the controller might shut off the plant because the waves could damage the structure, while in others the controller should operate purely to maximise the energy passed to the electricity grid. The fundamentally nonlinear dynamics of the OWC–WEC influence the choice of control algorithm for the WEC. Different outcomes in performance may be caused by very small changes in controller action. This is especially true for those OWC–WECs whose characteristics include stalling under certain conditions for optimal performance. Robustness to uncertainty in inputs and prevention of damage to the structure are necessary. However, too much conservatism will lead to unnecessarily low extracted powers. In the present paper, the advantages and disadvantages of feed-forward controllers and artificial neural networks previously used on OWC–WECs are discussed, as well as the testing of model predictive control and fuzzy logic controllers in the OWC–WEC context. Abstract: Renewable energy extraction from tidal range and/or tidal current technologies in a particular area will affect the hydrodynamics of the local tidal system differently, impacting the tidal resource at the particular site. There may also be a regional effect on the hydrodynamics, affecting other tidal energy extraction schemes’ resource and potential energy yield. The impact of large–scale and/or widespread tidal energy extraction on the tidal energy resource is therefore important to understand in order to inform optimization and management of the UK tidal resource. The present paper discusses a new tool that has been developed to provide capabilities for pre-feasibility assessments of energy extraction. The tool is called SMARTtide and is based on the 2D module of the open source TELEMAC system, a finite element shallow water solver. • the coarse continental shelf model (CCSM), with 1km resolution at the coast and sites of interest. Depending on the energy extraction scenario envisaged, simulation for a representative 15–day spring-neap tidal cycle takes on average less than 2hr for the detailed model and less than 1hr for the coarser model on a supercomputer (nine 12-core processors and one 12-core processor,respectively), which can be seamlessly accessed via a webinterface. Abstract: The present paper gives an overview of the lessons learnt from the project called Components for Ocean Renewable Energy Systems (CORES). In the context of this European funded 7th Framework Programme research project, new components and systems for ocean energy devices were developed and trialed. The present paper also details the work packages, major achievements, significant impacts, summary results and the outcomes of the sea trials. How deep is the ocean – How high is the sky? 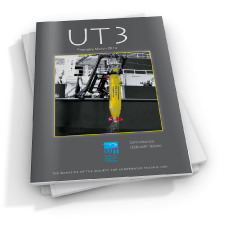 Abstract: The present paper outlines a new method to acquire experimental data for validating simulation models of highly manoeuvrable unmanned underwater vehicles (UUVs). Full-scale manoeuvring trials have been performed with the Defence Science and Technology Organisation’s (DSTO) Wayamba UUV at Corio Quay, Geelong. These manoeuvres are based on the International Maritime Organization (IMO) standards for ship manoeuvring, but have been adapted for application in a wide range of UUVs, including novel flatfish designs. The manoeuvring trials undertaken included straight-line speed tests, acceleration/deceleration tests, static turn tests and a variety of directional zigzag tests. In addition to representing a baseline dataset for investigating how design or configuration changes impact vehicle manoeuvrability, the data collected from the full-scale manoeuvring trials also showed them to be well suited to simulation model validation. Details of a DSTO-developed, MATLAB®-based model of the vehicle used for investigating low-level vehicle dynamics and performance are also provided. The representativeness of this model was demonstrated by comparing the model to a subset of the manoeuvring trial data. The manoeuvring trial results also provided some interesting insights relating to Wayamba’s manoeuvring performance, such as the vehicle’s initial turn bias and the efficiency differential between its main thrusters. Abstract: The present paper describes the hydrodynamic forces acting on different sized fish-shaped objects in a von Kármán vortex street, where in a wake of an object a specific locomotion pattern, Kármán gaiting, is observed. The present paper investigates the hydrodynamic forces, both lateral force and torque on a passive fish-shaped body in those hydrodynamic conditions. By using a range of fish length to wake wavelengths, size matters were experimentally tested for balancing the forces on an artificial fish intercepting oncoming vortices, potentially to exploit the lateral and rotational elements in the flow that may facilitate Kármán gaiting in a biological fish. To do this, five artificial fish were manufactured to mimic a rainbow trout (Oncorhynchus mykiss), were inserted into the flow tunnel and recorded simultaneously the hydrodynamic forces and DPIV images. The experimental results found that the hydrodynamic forces supporting Kármán gaiting did not stop even if the body length of the fish-like object exceeded the wake wavelength. Overall, the obtained results help to understand fish and fluid interactions when swimming in the Kármán vortex street. Abstract: Subsea development managers are faced with tasks of meeting concurrent development schedules, coordinating the work of large numbers of technical personnel, allocating requirements to multiple system elements, acquiring equipment from multiple vendors and adjusting interfaces for compatibility. Systems engineering (SE) is evolving as a key enabler of subsea production system design and acquisition. 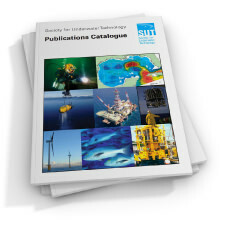 The present paper applies the SE concept, as well as system thinking, to the design of subsea production systems. SE is a suitable tool for managing complex problems by breaking them into manageable size. It starts with understanding of the desired capability and evolving the solution through various subsystems and components required to meet this capability over the life of the system. With an understanding of SE principles, one can appropriately tailor the SE process to the development of any system or finding solution to any problem. The SE process inputs consist primarily of the field data, the current capabilities/infrastructures, technical limitations, customer’s needs and objectives, and project constraints. Project constraints shape the project and include budget limitations, schedule deadlines and constraints such as a weight limit or the water depth. The scope of SE is to establish the requirements and physical subsea architecture, manage its development into a detailed definition and assess that the required performances are achieved. 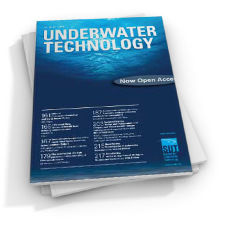 Abstract: Scientists planning to use underwater stereoscopic image technologies are often faced with numerous problems during the methodological implementations: commercial equipment is too expensive; the setup or calibration is too complex; or the imaging processing (i.e. measuring objects in the stereo-images) is too complicated to be performed without a time-consuming phase of training and evaluation. The present paper addresses some of these problems and describes a workflow for stereoscopic measurements for marine biologists. It also provides instructions on how to assemble an underwater stereo-photographic system with two digital consumer cameras and gives step-by-step guidelines for setting up the hardware. The second part details a software procedure to correct stereo-image pairs for lens distortions, which is especially important when using cameras with non-calibrated optical units. The final part presents a guide to the process of measuring the lengths (or distances) of objects in stereoscopic image pairs. To reveal the applicability and the restrictions of the described systems and to test the effects of different types of camera (a compact camera and an SLR type), experiments were performed to determine the precision and accuracy of two generic stereo-imaging units: a diver-operated system based on two Olympus Mju 1030SW compact cameras and a cable-connected observatory system based on two Canon 1100D SLR cameras. In the simplest setup without any correction for lens distortion, the low-budget Olympus Mju 1030SW system achieved mean accuracy errors (percentage deviation of a measurement from the object’s real size) between 10.2 and –7.6% (overall mean value: –0.6%), depending on the size, orientation and distance of the measured object from the camera. With the single lens reflex (SLR) system, very similar values between 10.1% and –3.4% (overall mean value: –1.2%) were observed. Correction of the lens distortion significantly improved the mean accuracy errors of either system. Even more, system precision (spread of the accuracy) improved significantly in both systems. Neither the use of a wide-angle converter nor multiple reassembly of the system had a significant negative effect on the results. The study shows that underwater stereophotography, independent of the system, has a high potential for robust and non-destructive in situ sampling and can be used without prior specialist training. Reliable power supply is required for operating subsea installations, such as enhanced oil recovery systems, tidal power generator systems and benthic environment monitoring stations. Electrical and electronic systems need to be operated inside pressure-rated or pressure-compensated enclosures so as to protect them from external seawater and hydrostatic pressure. Such enclosures are nitrogen filled, partially oil filled, fully oil filled or pressure compensated. System breakdowns lead to huge production losses and loss of critical environmental data. Reliability and, hence, the useful life of the internal systems depend mainly on the internal ambient temperature and relative humidity levels. The present paper discusses the need for efficient thermal and humidity management, methods currently adopted in the industry and their limitations in long-term operation. Solutions to carry out effective thermal and humidity management in future subsea electric systems, with the objective of reduced maintenance over the design lifetime of the system, are discussed. The proposed thermal management techniques include use of static fans, thermoelectric coolers, acoustic-based heat transfer and bio-fouling control methods. Proposed humidity management techniques include thermo-siphon-based water removal, and in situ subsea-based molecular sieve oil filtration. Further, the advantages of pressure compensation in overcoming the thermal and enclosure structural challenges are explained. The ongoing global efforts in the development of pressure-tolerant systems, significant findings on the component behaviour to pressure and the need for accelerating pressure-tolerant electronic developments are discussed. Abstract: For optimal safety a dive computer should be easy to use and the displayed information easy to understand. The present study examines the usability of dive computers and potential technologies to enhance safety. It should be noted that even if the ease of use of a dive computer is increased to an extent where it is intuitive to use, this does not release the diver from the recommendation to read the dive computer manual to safely dive with it. For the present work, 47 dive computer models by 14 manufacturers were purchased and the manuals of another three were studied. Function selection was noted for each model. Where selection required a combination of long and short pushes, or more than one button, it was considered necessary to read the instruction manual merely to modify settings in the dive computer. The mean number of buttons, switches or contacts per dive computer was 3.3 (SD 1.1, range 1–7). Twelve models (24%) did not have multiple functions per button, one model (2%) had a single multi-function and 36 models (72%) had multiple multi-functions per button. Accessing these functions required short or long push combinations. In 41 out of 50 (82%) of the dive computer models, the user interface was not intuitive. The majority of popular dive computers employ combinations of long and short pushes to access multiple functions, requiring training and mnemonic effort to operate the device. They are not intuitive, and scope exists to improve the usability and safety of dive computers. Possibilities are described including touch screens, a wheel to replace traditional buttons and near field communications (NFC). 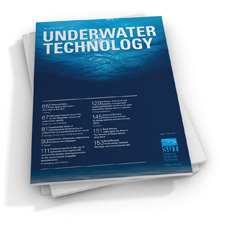 Abstract: Optical wireless communications (OWC) are being considered for use under water because sea water exhibits a window of reduced absorption in the visible spectrum, particularly between 400–550nm. Recent technology has demonstrated the ability to support mid-range links (<200m) and at high bandwidths (<1Gbps) in clear oceans. The present paper outlines the governing transmission characteristics and reviews current experimental research in underwater OWC, highlighting the importance of the local chlorophyll concentration, particulate concentration and the resultant wavelength selection. Ideal wavelengths are found to be from 430nm, which represents a deep blue colour, to beyond 550nm in areas where the chlorophyll concentration is high. Abstract: Trajectory of objects falling into water and their landing point and orientation are of interest for the protection of oil and gas production equipment resting on the seabed. Falling of small-scale model cylinders through water with low velocity has been investigated experimentally. Several experiments have been conducted by dropping model cylinders with the density ratio higher than 1 into a pool. The main objectives were to observe the trajectory and the landing point. Similar experimental results published by other researchers are reformulated to give common normalised landing points, which were then used to compare with the author’s tests. Abstract: The use of unmanned underwater vehicles (UUVs) to enhance the military capabilities of submarines and to reduce their operational risk is being considered by navies around the world. However, a major difficulty with the operations of UUVs is their recovery back to the submarine at the end of the mission. Various schemes have been proposed by a number of organisations working in this field; however, they all have major drawbacks. A simple concept is proposed based on a warp from the submarine to a low aspect ratio wing, similar to an otter board used by fishing trawlers. This approach allows the submarine to recover the UUV by slowly overtaking it. This is done at a sufficiently large transverse distance between the vessels where hydrodynamic interaction between the two is minimal, with the submarine travelling at a speed at which it can be safely controlled. Abstract: The present paper applies the threat matrix, developed for the integrity management of offshore oil and gas systems, to address reliability and maintainability requirements for a typical wave or tidal energy device. It includes some comparisons with oil and gas subsea infrastructure. The aim is to ensure a realistic assessment of life cycle maintenance requirements and life cycle costs. Abstract: Subsea cable localisation is a demanding task that requires a lot of time, effort and expense. In the present paper the authors propose a methodology that is automated and inexpensive, based on magnetic detection from a small unmanned surface vehicle (USV) and the use of a batch particle filter (BPF) algorithm. A dynamic path planning algorithm for the USV is also developed so that adequate samples of the magnetic field readings can be gathered for processing by the BPF. All of these elements work together online as the cable is tracked, which was demonstrated in a simulated mission. Abstract: Engineers are often called to deal with situations for which there is no precedence or a known solution. They rely on their expertise to make decisions, and in some cases the reasoning behind such decisions is not immediately obvious to others. The present paper promotes the concept of evidence-based practice (EBP) for subsea engineering, with the intention of complementing engineering judgment and making it more transparent. The approach is based on posing pertinent questions and finding satisfactory answers, then analysing and synthesising them to obtain sound decisions. In this approach, engineering judgment is the glue which binds the best available evidence. Evidence could be research based, empirical, peer assisted or lessons learned synthesised using reasoning or by mathematical and statistical methods. The underlying premise of the present paper is that engineering judgment is the ability to fuse data from diverse sources. Such ability is indispensable when dealing with complex systems. Experts’ biases can be mitigated if the best available evidence is systematically collected, validated and used in judgment by several experts. The EBP framework formalises what is already used by most engineers in practice. Abstract: The acquisition of representative subsea fluid samples from offshore field development is crucial for the correct evaluations of oil reserves and for the design of production facilities. Employing a transient multiphase flow simulation program, an integrated virtual sampling model was developed that captured the essential building blocks of the subsea production system. With the virtual sampling model, every single fluid component was accounted for throughout the calculation, enabling simulation of scenarios such as start-up and blowdown with a high level of detail and accuracy. Therefore, the model provides a predictive tool to test and monitor subsea operational conditions for the life of field. The application of the model should reduce the frequency of subsea intervention operations required for the offshore oil and gas industry, with considerable saving on operational expenditures. The present paper explores the derivable benefits of the integrated virtual sampling application to maximise value on deepwater field development. Abstract: The present paper analyses the reliability of the Indian tsunami buoy system (ITBS) from the point of view of societal importance. The ITBS was developed and maintained by the National Institute of Ocean Technology (NIOT) in the Bay of Bengal and Arabian Sea. The system involves high-precision ocean bottom pressure measurement, in situ computation and acoustic telemetering devices installed on the ocean floor, which transmit the anomalous change in the water column to the moored surface buoy. The surface buoy, in turn, relays data to the mission control centre shore station for predicting and advancing decisions in the event of a tsunami. The system has to be operational throughout the year and alert the Indian coastline in the event of a tsunami, and therefore the system should be trustworthy. Since its inception in 2007, the system has undergone many technological improvements with the main focus being on reliability. The health, safety and environment analysis indicates that, with one offshore node reporting its health every 10 hours to the mission control centre, the system could comply with the stringent Safety Integrity Level (SIL) 4. The result is found to comply with the actual system where reporting every hour is being implemented. The present study gives confidence on the ITBS’s reliable support to the Indian Early Tsunami Warning System. Abstract: Preliminary results from data collected along mid-slope depths in the northern Gulf of Mexico are very promising in regard to the applicability of short offset, ultra-high-resolution, three-dimensional (UHR3D) seismic methods in the detection and delineation of geohazards. 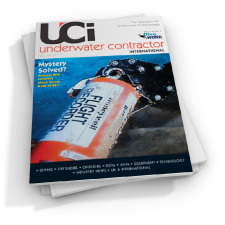 Penetration of greater than 2s two-way travel time (TWT) below seabed was achieved with a P-Cable™ system comprising 18 streamers that were 100m in length and a 210in3 Generator-Injector (GI) air gun fired in harmonic mode. Dips in excess of 17° were imaged at greater than 1s TWT below the sea floor. Between the sea floor and 1s TWT below the sea floor, the dominant frequency recovered is between about 78Hz and 100Hz. Apparent subsurface horizontal resolution is in the order of 16m, and subsurface vertical resolution is as high as 1.6m. Seafloor resolution is consistent with the natural bin size of 3.125 × 6.25m. Abstract: The marine energy community has been engaged with standards since 2008 as a necessary adjunct to the development of a maturing industry. The present paper seeks to present a brief rationale for standards in this context, provide a summary of the key events to date and explain the international arrangements for standards-making and compliance in the marine energy sector. Finally, the present paper is intended to challenge and encourage people to become involved in the setting of standards for marine energy.